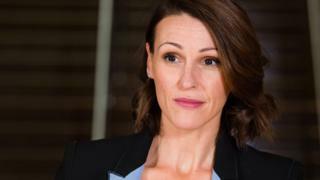 Doctor Foster actress Suranne Jones has said she is "so gutted" after pulling out of West End play Frozen due to illness. The star, 39, apologised to fans after she missed the last four performances of the show's run, which finished on Saturday. Jones, who played a mother whose child has been abducted, said the show subject matter was "deeply affecting". "I'm certain it has contributed to my feeling under the weather," she added. Posting a message on her Instagram page, Jones said she was unable to finish Thursday's matinee at the Theatre Royal Haymarket in London after feeling dizzy on stage. "I came back after an illness and it was perhaps too soon," she wrote. "Anyone who knows the show knows it is a highly draining piece and after three months and a sickness I just wasn't able to end the run." She said she had hoped to return to the stage for the final performance on Saturday but was told by her doctor she should not "put myself through it and risk getting ill again". "This show has taken its toll on me," she said. "You as the audience experience it once and always say how you are moved and drained by it. We as performers always think we can push through and carry on but sometimes we just can't." The Bafta award winner said she plans to rest before filming begins for new eight-part BBC series Gentlemen Jack later this month. The series, which is created and directed by Happy Valley writer Sally Wainwright, will be filmed in West Yorkshire and Copenhagen. Jones played the role of Dr Gemma Foster, a woman who suspected her husband of having an affair, in the BBC One drama series Doctor Foster.